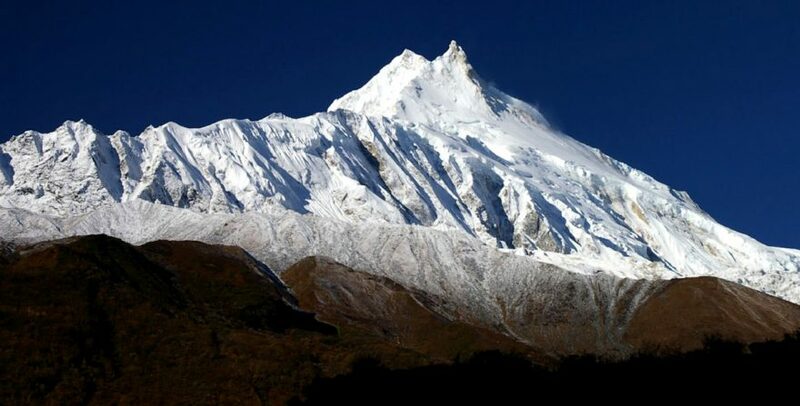 Manaslu Annapurna Trek is a tremendous opportunity to trek along the Manaslu and Annapurna region. You can also explore Tilicho Lake. Manaslu Annapurna Trek with Tilicho Lake is an exciting expedition by Bharal Adventure. You can explore not only these two regions but also the areas of Jomsom. This trek is a terrific opportunity for adventure lovers to fill their holidays with audacious trek, exploration of ethnic culture, tradition and religion, pastoral and village settlements, views of mesmerizing mountain peaks, tranquil lakes, thundering rivers and stream, strenuous passes and lush and dense forests. Manaslu Annapurna Trek offers the swashbuckling wilderness adventure opportunities. The crossing of the Thorang La Pass and the daunting Larke La Pass presents the amazing experience of the mountain life. The villages of the Manaslu region offers the chance to know about the Tibetan, Aryan and Mongolian tribes of Nepal. The more you trek higher the more differences in culture and traditions can be observed. The journey starts from the temperate forests zone. Than reaches the alpine forests zone then towards the barren land and finally to the subtropical temperate forest environment. This result in the diversified holiday in Nepal opportunity. Trekking around Manaslu provides a unique prospect of experiencing a reasonably untouched region of Nepal. So, Annapurna region is one of the most popular trekking destinations in the world. It is not only the combination of these two but also the chance to visit Tilicho Lake within this trek which adds up to the thrill and excitement. Bharal Adventure Pvt. Ltd. offers the amazing journey full of touristic attractions less explored by the tourists. This trail can also be termed as the off the beaten trekking trail of Nepal. One of our guides will accompany the guests for their sightseeing excursion in Kathmandu where they will be visiting the Kathmandu Durbar Square, Swayambhunath Stupa – The Monkey Temple, Boudhanath Stupa and Pashupatinath Temple, all of them declared as the UNESCO World Heritage sites. A pre-trip discussion shall be arranged in the afternoon where the participants could meet the team leader and crew members. Beginning our day early, we get started on our drive to Sotikhola enjoying the views of the Nepalese countryside and mountain backdrop. Although the drive to Dhading Bensi from Kathmandu is smooth, from there is Arughat is a rough drive. After our arrival in Arughat, we drive further to get to Sotikhola where we will spend the night. Climbing a rocky ridge to Salleri, we descend down to Sirdibas from where the trail continues up to Ghatta Khola. We move further upstream to a long suspension bridge in Philim, a large Gurung village from where the trail turns north just above the lowest house in the village and stays on a fairly level trail as it crosses millet fields to Ekle Bhatti. From here, the route enters a steep, uninhabited gorge from where we descend to the grassy land slopes crossing the Budhi Gandaki and then trekking along the west bank for a while. From here, we cross the river to east bank and then back again. We continue further through the trail into the valley that widens and then pass through bamboo forests to reach Deng Khola, on crossing which, we arrive at the small village of Deng. Crossing the Budhi Gandaki River, we climb to Rana village at 1910m from where we climb further to join a trail from Bhi then head west up the Budhi Gandaki Valley. From here, the trail passes through forests and Mani walls where we turn towards a corner that contours to Ghap. Taking the route through Prok village, we cross the Budhi Gandaki River once again following the steep trail up stream through a dense forest until we ascend to Namrung. Climbing steadily and passing through forests, we reach Lihi, a fine village with many chortens and barley terraces, from where we descend across the side valley of Simnang Himal with Ganesh Himal close to it. Passing through Sho, Lho and Shyala villages we arrive at Sama village where we will explore the famous Ribung Gompa and stay for the night. The day is spent acclimatizing at Samagaon for which we will hike to Pungyen Gompa along the Mani stones with Buddhist texts and pictures and the Sherpa women clad in traditional clothes and ornaments. The Gompa is close to Sama village and has a great view of the glacier. Pungyen means bracelet. Descending to the Budhi Gandaki River, we follow the trail leading to Larkya-La passing through several Mani walls and juniper and birch forests of Kermo Kharka. We descend down across the Budhi Gandaki through a wooden bridge and climb steeply onto a headland between two forks of the river. A white Kani is visible from a stone arch which we will pass through to get to Samdo. Yet another day set aside for rest and acclimatization, on the eleventh day, we hike towards the back of Samdo village to one of the trade passes to Tibet for excellent views of Mt. 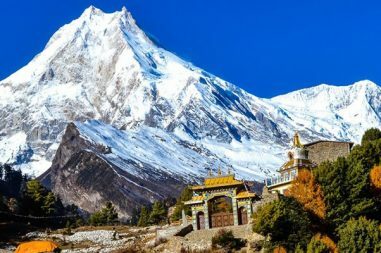 Manaslu along with other Himalayan ranges including Simrang, Hiunchuli, Ngadi, Larkye Peak, Cheo and possibly Kang Guru behind the pass. Passing through many seasonal herding settlements called doksas and getting the sights of mountain birds such as Lophophorus, the national bird of Nepal, Lammergeyer and Himalayan Griffin soaring high above us, we explore the villages in the area. Another option for the day could be a trip to the Gya-La (meaning ‘large pass’) to the north of Samdo which is more frequently used trading route to Tibet. However, this is a longer hike and could be tiring. Continuing our walk down the edge across the wooden bridge over Budhi Gandaki, we begin our ascent crossing two streams and viewing the Larkya Glacier as we go around the valley of the Salka Khola. We climb up again to the stone guest house at 4,450m which is not a lodge but a kind of shelter called Dharmshala in Nepal, also known as Larke Phedi. The rest of the day will be spent on acclimatization and exploration of the area. We reach a valley on the north side of the Larkya Glaciers after a short climb where we are rewarded with the magnificent views of Cho Danda and Larkya Peak. Walking across the moraines of the glacier, we make a gradual ascent along the trail that steepens only on the last section of the pass. Witnessing the outstanding views of the Himalayan peaks such as Himlung Himal, Cheo Himal, Kang Guru and the Annapurna II, we descend down to Bimthang. Descending down across a high pasture named Sangure Kharka, we cross a bridge over Dudh Khola from where we start our walk through the rhododendron forest following a trail through a narrow valley until we reach the highest cultivated land of the valley at Karche, 2,785 meters. Passing across fields, we make a steep climb over a ridge from where the trail turns into a big, sweeping arc to the river bank at the altitude of 2,580 meters. A short distance from here will take us to the village of Gho where the night could be spent, however, since there are better lodges available at Tilije, Bharal Adventure suggests we take the short walk further to Tilije village. Joining the classic Annapurna trail, we descend first then crossing a suspension bridge and ascending until we reach Thoche Village. From here, we follow a fairly straight trail and come across a Power House for electricity production in Bagarchhap village. 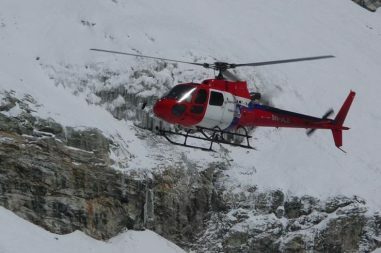 We then negotiate a few steep forested ridges along several landslides on route to Chame which nevertheless is rewarded with the views of major Himalayan peaks such as Lamjung Himal, Annapurna II and Annapurna IV. Through the western gates of Manang following the path down to the river, the walk continues on the southern side through coniferous forest. After reaching Kangsar village, further climbing takes us towards Siri Kharka passing a monastery. The tiring uphill climb is made easier by the company of Gungang Himal and Mt. Chulu in the background. Although the trail from Siri Kharka to Tilicho Base Camp is neither very steep nor physically strenuous, it nevertheless, is exhausting as the travelers have to walk on the narrow paths with areas prone to landslides. The trail goes through the middle of the landslide area whereby a impressive rock formation greets the travelers along the trail. The initial tough, steep and switch backed ascend gradually turns into steep incline before reaching the watershed. The trail is accompanied by yaks and deer grazing around the field by the side of the trail. A spectacularly large lake, Tilicho is nestled at the foot of the north face of the Tilicho Peak. Referred to as ‘The Great Ice Lake’ by the leader of French expedition, Tilicho holds an important place for Hindus because of its mention in one of their holiest texts – The Ramayana. After enjoying the tranquil lake and capturing its image into our memories and camera, we retrace our steps as we return to Siri Kharka. We take the route from Siri Kharka to Yak Kharka that lies on the main circuit trail avoiding the backtracking to Khangsar and Manang. Descending down from Siri Kharka towards Thare Gomba, we reach the trail junction within few minutes from where we turn left and reach Old Khagsar, a settlement that is inhabited only by occasional herders or during festivals, after a walk further. Following the rock wall north out of Khangsar, we walk further until we reach the seasonal bridge in the Thorang Khola Valley which we cross to the east bank and ascend to a plateau from where walking further will take us to Yak Kharka. Taking the uphill walk and crossing a suspension bridge, we arrive at Ledar village from where we ascend towards Thorang Phedi which takes only about an hour from Ledar. This trip is accompanied by one of the best views of the Himalayan ranges such as Mt. Gundang, Mt. Syagang, Thorang Peak and Mt. Khatungkan. Crossing the famous Thorang-La Pass (5,416m/17,769ft), we ascend towards Muktinath on this day. One of the exhilarating treks, the pass also serves as a transition from one major Himalayan valley to another. We take the gradual descent from the pass which slowly becomes steeper as it goes to the south side of the valley. Crossing a suspension bridge, we walk further beyond the famous Muktinath Temple to get to the village of Muktinath/Ranipauwa from where we start on our drive to Jomsom.